Our deli offers the best meats, cheeses and other goodies to satisfy your needs. Looking for a meat, cheese or produce tray for your next event? Ask the deli or produce manager today. They can help you decide what to get and how much you will need. We offer pasta, potato and macaroni salads along with other varieties that would melt your taste buds. 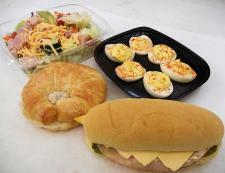 Also found are your quick lunch items like lettuce salads, cooked/deviled eggs, croissants and sub sandwiches. How about some taco dip with those chips? Often you will find fresh product prepped and ready to go straight to the oven...for instance chicken cordon bleu, whole chicken with stuffing, stuffed mushrooms or onions (seasonal) or try our heat and eat items. One example is our yummy deli garlic mashed (or plain) potatoes.